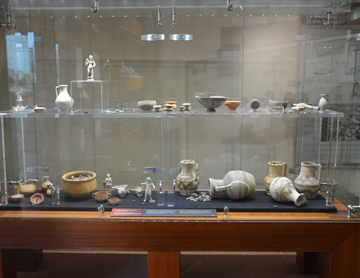 The MAB, ‘Archaeological Museum Ferruccio Barreca’ in Sant'Antioco, preserves and displays a wide range of artifacts from the island of Sant'Antioco. The main part of the collection it’s about the important urban settlement built on the eastern coasts of the island at the beginning of the eighth century. B.C., known by the name of Sulky or Sulci, port benchmark of the territorial district of the south-western Sardinia that, with the metal sector of Iglesias, forms the sub-region of ‘Sulcis-Iglesiente’. 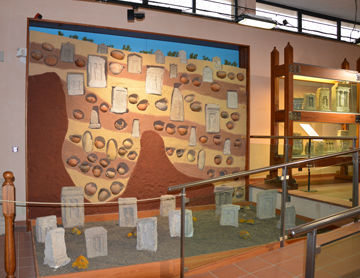 The museum route follows a topographical and chronological criteria based on the three main aspects of the urban settlement since its origins: the built town, the necropolis and the ‘tofet’. 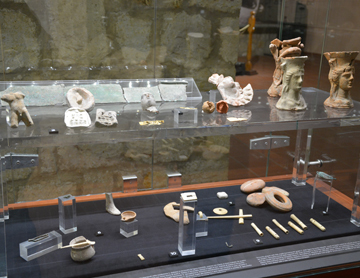 The main topographic units are divided in three different exhibition halls: the first is dedicated to the built town contexts, the second and the third to funerary contexts, respectively with the cemeteries of adults and with the sanctuary with alsofuneral function of the ‘tofet’. Within the individual "topographic" units has been followed a chronological order, starting from the oldest to the more recent discoveries.